Got two set of white china dress for dollfies — the traditional long china dress that goes all the way to the ankle and the mini china dress :evil:. The china dress is made by AZone International. 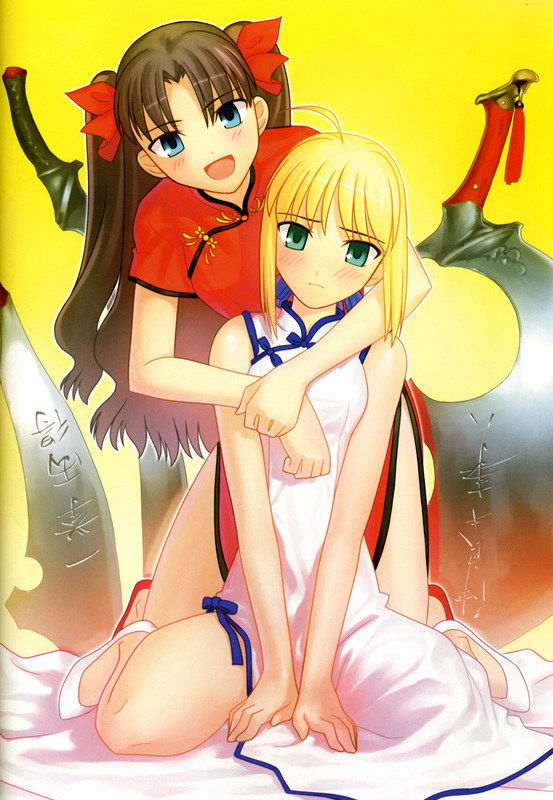 Saber volunteered to model the dresses for us in her golden curls. Now for the short china dress. With that gorgeous golden curly hair. Most of the outfits from AZone International can be order from shops like Hobby Search, AmiAmi, or Hobby Link Japan. Of course old outfits might not be available any more and will be difficult to obtain. But if it’s released recently or to be released then you can look into those shops first. They are all English site so you should have no problem navigating it although all shops are based in Japan. And if you list the outfits that you see, I can always take a look and see. Okay I’m a bit confused as what you want to get. SSK019 and SSK014 are for 27cm dolls while FAR 043 is for 50cm dolls. So I’m not sure if they are for your different dolls or you didn’t see the doll size on those outfits. For 50cm Kimono FAR043 I suggest you to enlist yourself on the waiting list at Hobby Search. It is relatively new and they might still be able to get it. Once one the waiting list email, Hobby Search will email you when they do have stock (and they will try to get stock for it if you are on the waiting list). But doesn’t force you to buy it even if it comes into stock. Yep. So for AZone outfits to be put on a DD, you would want their 60cm series. And some outfit or components of a 50cm outfit might fit but some might not. Doll sizes are very important when you trying to get clothes so make sure you look at that first. Most should mark down as ? ?xm or 1/3, 1/6 sized doll. Some doesn’t like Pure Neemo but those are typically around 1/6 size.